The film industry is one place where there are no age restrictions. Anybody at any point of time in their life can find a special place in cinema. 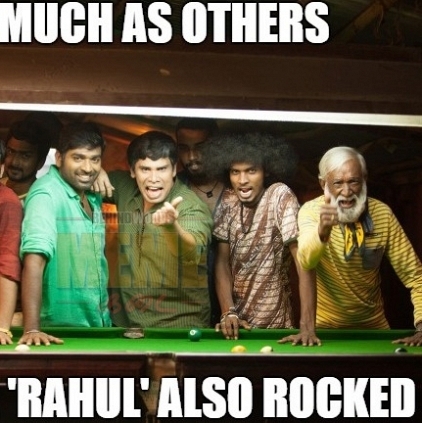 In the recently released Naanum Rowdy Dhaan, along with Vijay Sethupathi, Nayanthara, Parthiban, Radhika Sarathkumar and RJ Balaji, 'Rahul' thatha had his share of audience response for his energetic performance. His real name is Udhayabanu and when the artist was called to congratulate, we were surprised to get the kind of information we never expected. 'I have been associated with the film industry for more than 48 years now. I was working on the production side, then later joined MGR sir's office and that's when I had the chance to be part of Adimai Penn. That's my first film and I play one of the slaves. Later on, I was occasionally called to act and till date I have done around 15 films with MGR and about 9 films with Sivaji Ganesan. I have also spent time acting in dramas. Years later, I got to do some important characters in Kaththi, Purampokku and now Naanum Rowdy Dhaan. It is all your support that matters to me”. At the age of 74, there is no stopping 'Rahul Thatha'. Watch out for his performance in Aranmanai 2 and a lot more to come. People looking for online information on Actor Udhaya Banu, Naanum Rowdy Dhaan, Vignesh shivan will find this news story useful.